The Big Idea: Kids with asthma can still play and have fun! 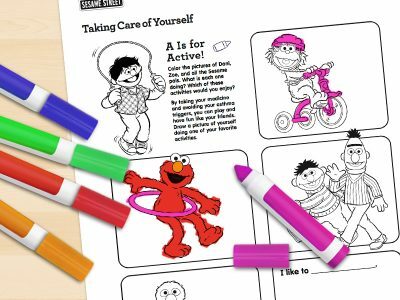 Print this page for kids to color. Encourage them to add their own favorite activity in the blank box. Remind kids that asthma doesn’t have to stop them from having fun! They just need to remember their asthma doctor’s advice, such as staying away from triggers and taking their medicine. You might ask kids to name some of their triggers or explain to you how and when they take any medicine.